Keeping the stones rolling from Northern Europe’s largest aggregate quarry requires top people with rugged motivation and a staggering portion of patience. Or less so, when operating a SmartROC T45 drill rig. The automatic drilling function of the SmartROC T45 works smoother than anything Morten Natland has tried before. “It feels almost like sitting at home,” he says. 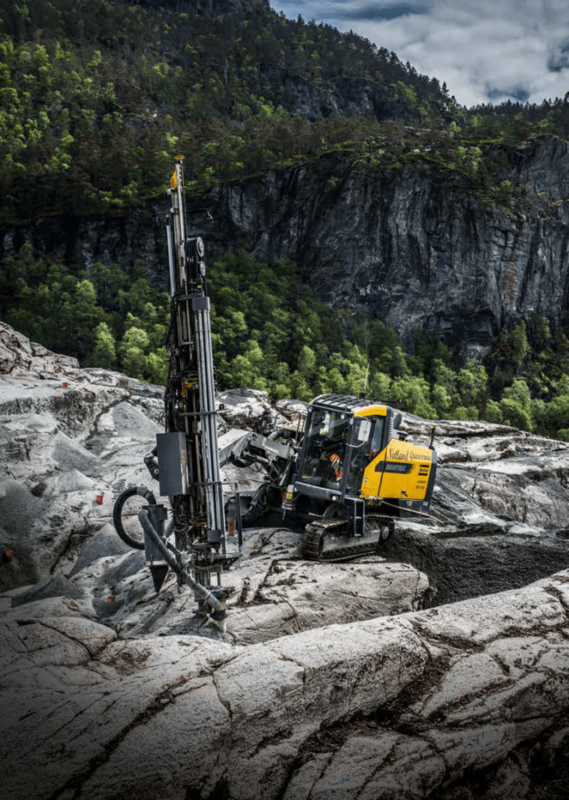 Natland is one of the seasoned operators at Natland Graveservice, a local entrepreneur with 20 employees drilling all the blasting holes in the aggregate quarry in Jelsa, Western Norway. Striving for an annual capacity of 10 million tons of granodiorite, a highly sought after stone variety used in construction, the quality and regularity of Natland’s drilling is crucial. Founder and owner of Natland Graveservice, Geir Natland, is making the investment calls. Currently, he has received three SmartROC T45 drill rigs and one Smart- ROC T40 drill rig. After two years of operation, Geir Natland has a firm grip on the SmartROC T45. Why did you pick the SmartROC when acquiring new drilling rigs? How do you assess the overall performance of the SmartROC T45? Could you disclose some specific details from your evaluation of the rigs? Tricky question: What improvements could make the SmartROC T45 even better than today? SmartROC T45 ■ Model: SmartROC T45. ■ Year: 2013. ■ Performance: 3 ½ – 5″ hole range, hydraulic rod handling system, 230/240 bar rock drill, chain-driven feed, 242 kW diesel engine, screw-type compressor, folding boom. ■ Navigation: Atlas Copco HNS, a GNSS site-navigation system, with two-joystick operation in air conditioned cabin.